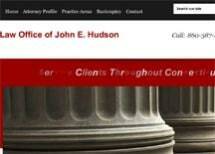 The Law Office of John E. Hudson is a general practice law firm with a focus on serving the needs of lenders, creditors and debtors in real estate, collections and bankruptcy related matters. Established in 1996, we have provided land title services to banks, mortgage lenders, State of Connecticut agencies, small businesses, individual borrowers and debtors. We provide these client services throughout the State of Connecticut only. Attorney Hudson is a land title agent for CATIC, the Connecticut Attorney's Title Insurance Company (a top rated land title insurance company) and a member of the Connecticut Bar Association.